This is a post to say thank you. Today, Museum 2.0 is celebrating its second birthday. And when I think back on the last year and how it compared to year one of blogging, the shining difference is you--your interest, your comments, and most of all, your extraordinary example. I started the Museum 2.0 blog in 2006 as a personal learning exercise about "the ways that museums do and can evolve from 1.0 (static content delivery machines) to 2.0 (dynamic content aggregation and network machines)." I had heard some influential museum leaders raise the question of what a wiki museum might look like, and I wanted to explore that and related concepts. I always assumed that this would be a semi-private endeavor and that the public nature of the blog would just be an efficient vehicle for sharing my ideas with a small group of interested folks. Two years later, things have changed for the blog--and more importantly, for the museum field. In the last year, I have seen traditional museum attitudes about social media and community co-design go from "why should we care about this?" to "how can my institution do this sustainably and successfully?" and watched the Museum 2.0 blog traffic climb from 600 viewers per week to 4,000. And people aren't just thinking about this stuff; many museums have taken real, exciting action in the last year. Institutions tying their online and onsite activities, as the Ontario Science Centre did when it hosted a YouTube meetup, or the Smithsonian American Art Museum did when they developed an alternate reality game. Small, quirky projects like the public art geocaching exhibition in Bellevue, WA, and inspiring surprises like the Living Library program and book-drop based tagging at Haarlem Oost. 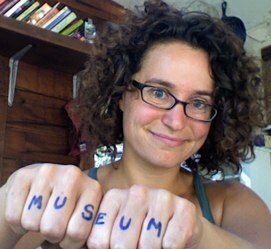 Excellent new blogs focused on the field like Museum Audience Insight and Useum. In other words, there's a lot going on. And from my perspective as someone who has been chronicling some of these efforts, they suggest not just experimentation but a new direction for (some) museums. I've sat on several task forces and program committees over the last year, and I'm always surprised to be at the table. I'm new to this side of museums, and I sometimes feel like the eighth party candidate who got invited to the debate. But enough of these experiences have convinced me that the participatory museum is not a fringe concept. There is funding. There is interest. There is (growing, tentative) respect. That's not to say that we don't still have to fight to make the best arguments for why these new processes and activities should be integrated into our institutions. I still talk to lots of folks, mostly young staff members, who are struggling to find ways to feature visitors' voices and break down standard authoritarian design structures. But now I'm also meeting just as many directors and museum leaders who are new to these topics and are trying to imagine how these kinds of activities can be intelligently integrated into their process. We need more advocates, more voices that can help navigate (and lead!) the future of our institutions. And so it's time for us to start talking to each other. As the audience for the Museum 2.0 blog has grown, I've grown increasingly uncomfortable with this site as a community-building tool. Yes, I love writing, and I am so grateful that you want to read what I have to say. For me, blogging is a wonderful way to add reflection and analysis to my design practice, and I'm flattered that you want to come along with me on that reflection. But this blog is mostly push content. It's very me-heavy and is not sufficient to support the energy in this community. I have met so many of you in the last year who are working on projects and new ideas and would really benefit from connecting to others in the loose "museum 2.0" community who are thinking along the same lines. You send me emails (which is awesome and I want you to continue) but I also want you to have access to each other and all of your collective brilliance. I shouldn't get to have all the fun. And so I'm offering myself up as a hub to help get a community project(s) started. I don't have a lot of free time on my hands, but I do have connections to all of you. I've put up a simple site that you can use to recommend community activities and tools that would be useful to you. You can also vote on others' suggestions and add comments. You'll see that I've put up some seed content; please don't let that constrain you from making your own suggestions. Please try to focus on things that you would actually, not theoretically, like to participate in. When activity dies down on the site, I'll report back on the outcome here on the blog and will offer what I'm willing to do to get the community started based on your preferences. If you want to take up other ideas from the site and start them on your own, awesome. If you want to start your own renegade thing that's unrelated, even better. We need more voices in this field, and I don't want to be a gatekeeper, just a springboard. And if you don't want to get involved with other community activities, that's fine. I'll still be here blogging. I hope you'll keep reading and sharing your thoughts and challenges and projects with me. I hope you'll keep commenting on blog posts--I LOVE when you comment on blog posts. I also greatly appreciate the work folks have put into organizing Museum 2.0 posts usefully on the Museum 2.0 Living Archive and hope that will continue. But no matter what your participation level, I can't overstate my gratitude to all of you. When this started, I never imagined that blogging would have such a positive, dramatic impact on my professional life. You have enabled that, by talking to me, sharing your experiences with me, sending posts to your colleagues, working with me, and supporting me. Thank you so much. Here's to another great year!